Samsung has created its most desirable and balanced phone yet, though there is a price to pay. While Apple is being praised and mocked in unequal measure for launching the "bigger than bigger" iPhone 6 with a 4.7-inch display and the even bigger iPhone 6 Plus - is that a reversing beep I can hear? 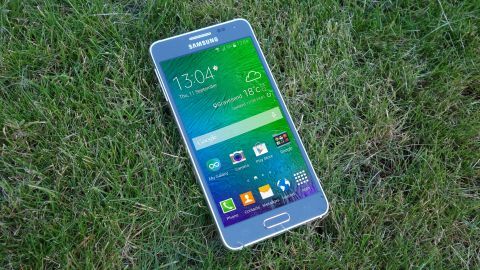 - Samsung has performed an about-turn of its own with the launch of the Galaxy Alpha. This is the first Samsung smartphone I can remember using that values attractive design ahead of spec list box-ticking. Whilst it's not the finished article, it marks a welcome departure in an exciting new direction for the company. It's also arguably the most balanced and comfortable-to-use premium phone Samsung has made since the Samsung Galaxy S2. Make no mistake though - this is unknown, risky territory for Samsung. The Samsung Galaxy Alpha is priced like a flagship phone, but it's technically out-specced by the Samsung Galaxy S5. Since its launch there have been a number of price drops, and you can now get the Samsung Galaxy Alpha for under £350 if you shop around. That's quite a big drop from the £549.99 asking price it launched with. Really, though, this simply reframes the age-old iOS vs Android argument with none of the platform bias - what makes a premium phone premium? Let's get the obvious comment out of the way early doors. The Samsung Galaxy Alpha looks a lot like an iPhone. While it's clearly been released to pre-empt the launch of the iPhone 6, though, the Alpha's design is pure iPhone 4. It's got a very familiar flat-edged aluminium rim with that same nick-inviting chamfered edge. Even the machined speaker grid on the bottom edge is reminiscent of Apple's seminal phone. Of course, the fact that Samsung has borrowed some ideas from Apple is far less noteworthy than the fact that it has finally adopted metal into its design process. Given how well the company has done with its first attempt, I have to ask: what took you so long, Samsung? This is a lovely phone to hold. It sits in one hand delightfully. As someone with larger-than-average hands, I can just about stretch my thumb to each corner of the 4.7-inch display without needing to shuffle the handset around in my hands. That's facilitated by a nice thin bezel and the Galaxy Alpha's super-thin body. At 6.7mm, it's not the thinnest phone in the world, but it's up there. It's also 0.2mm thinner than the similarly proportioned iPhone 6. Like Apple's new iPhone, Samsung has positioned the Galaxy Alpha's power button on the top right-hand edge of the phone, so you can reach it easily with thumb or finger. The volume rocker is on the opposite edge, if a little higher up. Both have a satisfying click to them. It's when you look closely at these side buttons that you realise the Galaxy Alpha's metal rim isn't quite as unoriginal as it first seems. There's a subtle outward curve just before you reach the top and bottom edges, which is both nice to look at and offers a useful niche to tuck your little finger into. You know you're definitely dealing with a Samsung phone when you turn it over - and we're not just talking about the Samsung logo or the centrally-mounted, square-rimmed, slightly protruding camera unit. The Galaxy Alpha's dalliance with metal extends only to its outer rim. The rear of the device is the same kind of soft-touch polycarbonate as we've seen before. It's one of the least objectionable uses for the material yet, though. Perhaps it's the fact that Samsung has done away with that awful faux-stitching effect, or the fact that it's framed by elegant metal rather than ugly shiny plastic. I don't know, but in this case Samsung's use of plastic is as notable and restrained as its use of metal. The decision not to opt for an all-metal body has led to a number of other benefits. It makes the Alpha easy to grip and handle, it allows for a removable battery, and it makes the phone remarkably light. Samsung is evidently pleased with the design of the Samsung Galaxy Alpha as it is basing the look of its new series of handsets on it. The Samsung Galaxy A5, along with the Galaxy A3 and Galaxy A7 have all taken design cues from the Galaxy Alpha, such as the elegant metal body. After the disappointing design of the Samsung Galaxy S5, we're also hoping that the Samsung Galaxy S6 will take cues from the Galaxy Alpha's stylish design. At 115 grams, it's 14 grams lighter than the iPhone 6. In fact, it's only 3 grams heavier than the 4-inch iPhone 5S. No, it doesn't quite feel as premium as either, but it's nowhere near as far off as Samsung's earlier efforts. And this introduces one of the most contentious specs of the Samsung Galaxy Alpha - its display. As I've already mentioned, this is a 4.7-inch screen, which kind of bucks the trend for recent high-end Android devices. The HTC One M8, the Google Nexus 5, the Sony Xperia Z3, and yes, the Samsung Galaxy S5, have all busted through the 5-inch barrier. Indeed, the Alpha feels like a blast from the past, going back to the time of the Nexus 4, the HTC One X, and the Samsung Galaxy S3. More pertinently, and as already discussed, this is the size adopted by Apple for its iPhone 6. The result is that you'll probably find the Galaxy Alpha either slightly smaller or slightly bigger than you're used to. My view? Like Goldilocks and the middle-sized bed, this one feels just right. It offers a clear view of HD video, games and most web pages without sacrificing portability or one-handed usability. Perhaps even more contentious is the Samsung Galaxy Alpha's display resolution. It's only ("only") 720p. Complaints about this lower resolution are valid - particularly given the Galaxy Alpha's premium price - but only up to a point. Yes, other Android phones have hit the considerably sharper 1080p resolution standard in recent times, but the vast majority of these have been larger 5-inch displays. In fact, if we're talking mainstream phones, only 2013's HTC One M7 really springs to mind as offering a 4.7-inch 1080p display. In a sub-5-inch screen like this one, 720p feels perfectly adequate. That's not to say that you definitely won't notice the difference in sharpness between the Galaxy Alpha and (for example) the Galaxy S5. But as it is, using the phone in isolation, the Alpha's display is plenty sharp enough. Indeed, with Samsung's expert - and still relatively unique - use of Super AMOLED technology, the Galaxy Alpha's picture positively pops from the screen. Colours are rich and contrast levels are exemplary, while you won't be experiencing inky blacks of this kind on any LCD panel. It still lends some icons and images a slightly false, gaudy appearance, but once you're attuned to it (or once you've tuned it to your liking) other displays can look a little drab by comparison.